Purely Pesto & WW-Friendly Recipes from HG! Would you please give us the stats on your Simply the Pesto Spaghetti without the tofu shirataki noodles? I'd like to make it with whole-wheat pasta and maybe use the pesto as a sandwich spread. Thank you! Place all ingredients in a small blender or food processor, and blend/process until a smooth paste forms. If you like, add additional salt and pepper to taste. Refrigerate until ready to serve! Enjoy! P.S. If you really love the stuff and plan to use it often, make a double batch -- it'll be easier to blend that way! 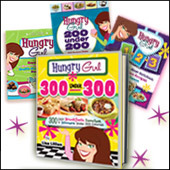 Will you be coming out with cookbooks that work well with the new Weight Watchers plan? And where can I find PointsPlus® values for recipes in the existing books? Thanks!